During the last three weeks, the Bolivian indigenous movement has taken to the streets in protest against a plan to build a multinational highway running through the Amazon, which would cross indigenous territory and a national reserve. The protests, in which indiginous groups were joined by other national civil movements, now seem to be growing in momentum, to the point of becoming a true popular mobilization. The Amazon highway is a project financed by the Brazilian government. The road is supposed to connect Bolivia with both the Pacific and Atlantic Oceans, crossing through Brazil and Chile. But it is also slated to pass through the Isiboro Sécure National Park and Indigenous Territory (TIPNIS). Two main concerns lie behind the indigenous protests of the highway: its environmental effects, as well as the indigenous community’s frustration with facing deadlock in their attempts to gain access to the decision-making process. The TIPNIS is a natural reserve, and it was recognized as indigenous territory in 1965. Such legal recognition provides the 49,000 indigenous residing in the park with the right to participate, by consultancy, in any governmental decision that could affect the integrity of their territory. What’s at stake, therefore, is more than the highway itself: indigenous jurisdictional recognition in general. Bolivia is among the Latin American countries that has ratified Convention No. 169 of the International Labour Organization (ILO) regarding indigenous population rights. One of the convention’s points is the need to guarantee consultation “whenever consideration is being given to their capacity to alienate their lands” and that “peoples must be consulted [previously] whenever consideration is being given to legislative or administrative measures which may affect them directly.” Consequently, so far as it has kept indigenous communities out of the decision-making process about the highway, the Bolivian government is breaking an international convention. Indigenous Bolivians have a strong tradition of taking to the streets to advocate for their rights and demand accountability from their government. Indeed, current Bolivian president, Evo Morales, is himself indigenous, and he started his political career as a representative of the Political Instrument for the Sovereignty of the People (IPSP) within the “cocalero” movement. The movement’s goal was to defend indigenous peoples’ rights by preserving their cultural traditions and their modus vivendi—the growing and commercializing of coca leaf. In 2002, the indigenous and farmers’ movement promoted Morales as their presidential candidate, along with the support of the Movement for Socialism (MAS). Thanks to this wide base of support, Morales was finally elected president in 2006 and re-elected for a second term in 2009. Considering his roots, many indigenous people in Bolivia find Morales’ support for the Amazon highway disappointing. Justa Cabrera, president of the National Confederation of Indigenous Women, considers the present conflict between the indigenous movement and presidential policies to be the just the latest blow after years of disappointment. “They used to believe in Morales because he was considered their main representative,” she says. “He was elected as the result of a long protest and struggle for autonomy, dignity, access to land property, and self-determination.” Once in office, though, he has turned from advocate to sometime adversary. Thousands of protestors took to the streets and began marching toward Bolivian’s capital of La Paz on September 25. Police and local authorities violently attacked protestors, suppressing the march and arresting hundreds of them, including leaders like Rafael Quispe (Aymara) and Adolfo Chavez (Confederation of Indigenous Peoples of Bolivia). On September 28, the indigenous movement received the support of the Labor Federation Central Obrera Boliviana (COB), along with health, municipalities and education workers, as well as the student movement. By that time, the march reached more than 5,000 participants. So far, the indigenous mobilization achieved several victories. Two government ministers have resigned as a result—those of Defense and Interior—as well as the Migration Chief. In addition, President Morales has been forced to suspend the project and start rounds of consultations with indigenous representatives in Cochabamba and Beni. Morales has suggested that a referendum would be a good way for people to decide about their future. However, this would mean that a decision affecting indigenous communities specifically would be handed over to the national population, diminishing their ability to affect the outcome. Indigenous peoples throughout Latin America have a long history of struggle for political recognition and respect. Even if indigenous interests might seem to run against national ones, these communities’ efforts to preserve their identity and autonomy also represent a bulwark against the temptation to unsustainable development. 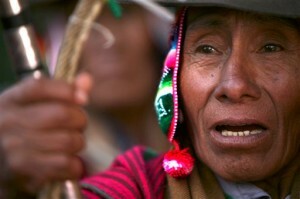 The achievements of this movement in Bolivia are shared among indigenous peoples and their supporters throughout Latin America.